May your dreams be filled with sparkling sugar, heady vanilla and warm amber. An intoxicating aura of rainbow wishes, magic and love for the bravest hearts. 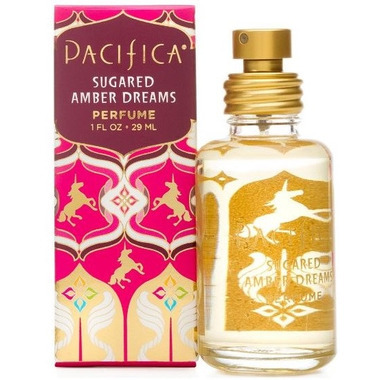 Fun, fresh and fantastic, Pacifica Spray Perfume is made with natural, pure grain alcohol (corn-sourced and gluten-free) and Pacifica's signature perfume blends with essential and natural oils. 100% vegan and cruelty-free. fragrance blend with natural and essential oils), aqua (water). I love this perfume...smells wonderful! I love Pacifica this one is nice. It has a soft sweet smell and a hint of little amber. I've bought it twice and will continue.